Configure your IDP, its relying parties (applications) and Trusted IDPs using a REST interface and make the configuration persistent in a database instead of using Spring configuration files. This blog focus on the new REST interface and the persistence layer using JPA. As you notice, all relationships are aggregations which means the lifecycle of application has no dependency to the claims. The relationship between application and claim is specical because depending on the relation an claim is optional or mandatory. The classes in the above class diagram map to root level resources which are independently managed (create, read, update, delete). Response Body: The created resource. Response Header: Location contains the URL of the created resource. The following example illustrates how the sub-resource Claim is embedded in the resource Application. As you noticed, the IDP supports a collection of IDPs. This is by intention even the current version doesn't support several realms in one IDP whereas the feature is already supported by the STS. This is planned in the next release. In smaller companies you might have only one Identity Store whereas in bigger companies you probably have more than one Identity Store. To avoid deploying each IDP realm in a different Servlet Contexts the Fediz IDP will support several IDPs in one deployment. The realms are differentiated by the URL which is addressed by property uri in the future. You can either start the IDP standalone (Jetty Maven Plugin) or within a pre-configured Tomcat Container. The fediz-idp.war does NOT ship the JDBC driver JAR. Be sure to deploy it under $CATALINA_HOME/lib. If you don't update the persistence.properties the default database is HSQL. You can also define the datasource on the Container Level if you like under the JNDI name java:comp/env/jdbc/fedizDataSource. The REST interface is in early stage and subject to change. It's very important to have a stable REST interface for future. As the current IDP doesn't provide a Web-UI yet, you can build your own Web-UI and use the REST interface to administer the behaviour of the Fediz IDP. Therefore, it's very important to get a stable REST interface without requiring changes in your Web-UI with each new Fediz IDP release. Please provide feedback to the CXF Dev Mailing list to discuss the feedback in broader audience. The CXF community has released the new Version of Apache CXF Fediz. Fediz helps you to secure your web applications and delegate security context to the underlying application which can be used for impersonation when calling other Web Services. With Fediz, authentication is externalized from your web application to an identity provider installed as a dedicated server component. The supported standard is WS-Federation Passive Requestor Profile. The major contribution is the refactoring of the IDP to leverage the functionality and flexibility provided by Spring Web Flow and Spring Security. I wrote about this new feature here. More details to come like customizing the signin flow, etc. Thank you for all support and feedback! In the first blog on this topic I explained how to add security domains to the Fediz STS which is based on the Apache CXF STS. This blog focuses on how to set up the Fediz IDP thus you can access an application but authenticate either against the requestor IDP of realm A or realm B.
I posted a blog some time back about WS-Federation across several companies and explained the benefits and key requirements here. I recommend to read that blog first. In the last blog, we've prepared the STS which is responsible to issue tokens for the two realms REALMA and REALMB. Further, the STS is able to federate between the two realms by mapping the identities (attribute type of Relationship bean configuration. This means, a person must have an identity in realm A (ex. bob) and an identity in realm B (ex. BOB). To keep it simple, the mapping is based to lowercase the username. Another option is to federate/map the claims which doesn't require that a person must have an identity in both realms. This requires more effort to set up a demo and might be provided in the future for illustration purposes, but all required functionality and extension points are available. The Fediz IDP doesn't support yet to host several realms in one WAR file. Therefore, two Servlet Containers must be set up to deploy the IDP war file. In B2B scenarios this won't be required anyway as the B2B partner has got an IDP attached to its realm as well as the application service provider has got an IDP attached to its realm. It might make sense in scenarios where the company itself has got more than one authentication systems in place. For ease of use, the Fediz IDP and Fediz STS are deployed into the same Serlvet Container and therefore accessed with the same TCP port. Due to the fact, that the Fediz STS supports both realms in one WAR file, the Fediz STS WAR fediz-idp-sts.war is just deployed twice. The Fediz IDP is provided as part of the subproject Fediz in Apache CXF. The new version provides the Apache Maven profile realm-a (Default) and realm-b which packages the IDP either for security domain REALM A and REALM B. Note: The built WAR files require that IDP Realm A is deployed into a Servlet Container running on port 9443 and IDP Realm B is deployed into a Servlet Container running on port 12443. If you want to change that then you must update the file WEB-INF/classes/realm.properties or at source location services/idp/src/main/resources/. I assume you have installed fedizhellworld example into a supported Serlvet Container. If not, install the fedizhellworld example based on the README.txt. You can either copy the file stsstore.jks from the STS archive within WEB-INF/classes or copy the file realma.cert from the STS archive from the same location. You have now deployed the IDP realm A (fediz-idp.war) into a Servlet Container listening on port 9443 and IDP realm B (fediz-idp-remote.war) into a Servlet Container listening on port 12443. Finally, the Relying Party has been updated to trust the IDP Realm A. You can now choose in which domain you would like to authenticate. Choose the IDP in the list and click Select Home Realm. If you choose Realm B you get redirected to IDP Realm B and username/password popup is shown (use uppercase username and passwords) or IDP Realm A shows username/password popup (use lowercase username and passwords). If you choose Realm B and enter the user ALICE and the password ECILA you finally see the user alice (lowercase) shown in the application. You know why? Exactly, the STS does the identity mapping when the REALM A is requested a SAML token for the application fedizhelloworld on-behalf-of the SAML token issued by Realm B. If your home realm is realm B and you're successfully authenticated, the IDP realm A won't redirect you to realm B the next time, as the original SAML token of realm B is cached in realm A. The design of the IDP changed (Spring Web Flow and Spring Security), new features are implemented and thus the configuration is completely different to version 1.0. I don't want to go into too much details in this blog, instead I'll update the Apache CXF Fediz Wiki soon. The main configuration file of the IDP is idp-config-realma.xml. This file contains configurations for the IDP, trusted IDPs and Relying Parties. If you want to configure an additional application add a ServiceConfig bean and add it to the map services in the IDP configuration bean. It's important that the attribute realm matches with the realm configured in the application (fediz-config.xml). The attributes tokenType, lifeTime and requestedClaims are optional. Only the protocol defined in the above bean is supported by the IDP and therefore the default value. The remaining attributes are ignored but used in the future like the Web GUI. If you want to configure an additional trusted IDP add a TrustedIDPConfig bean and add it to the map trustedIDPs in the IDP configuration bean. It's important that the filename of the PEM encoded certificate is configured which has been used to sign the SAML token by the trusted IDP. The attribute name is required for informational purposes whereas the remaining attributes are ignored but used in the future like the Web GUI. Even there is much more to say I finish this post and write about other features of the new Fediz IDP in the near future. Please post feedback and ideas to the CXF mailing list. Fediz 1.1 introduces a bunch of new features like support for Jetty, Spring Security and Websphere. But a lot of effort has been put into the Fediz IDP. I'd like to thank Thierry Beucher for his valuable contributions to the new release of the Fediz IDP. The IDP supports publishing the WS-Federation Metadata document which allows to more easily integrate the IDP into platforms which support referencing a Metadata document. Metadata consists of the signing certificate, the provided claims, etc. The IDP has been refactored to use Spring Web Flow to manage the federation flow. This provides flexibility to be able to customize the IDP to company's specific requirements. The IDP is secured by Spring Security to get the benefits and flexibility of Spring Security. This is the major new feature. The IDP is able to figure out from which security domain/realm the browser request is coming from to redirect the sign-in request to the requestor IDP which does the authentication and issues a token which is sent to the Resource IDP. The Resource IDP will then either map the principal from one security domain to the target security domain and get claims information of the mapped principal or transform the claims information and finally issue a new token for the relying party (application). More complex scenarios described in this blog are now possible. In this post, I'd like to focus on the last feature which I splitted in two posts. The first one focuses on extending the STS to support more than one security domain/realm and the second on the IDP. The Fediz STS is provided as part of the subproject Fediz in Apache CXF. The new version provides the Apache Maven profile realms which packages an STS with two security domains called REALM A and REALM B.
or download the archive from the snapshot maven repository. In the context of federation, you request a token from your requestor STS/IDP. In this example, either REALM-A or REALM-B with username/password (.../fediz-idp-sts/<realm>/STSServiceTransportUT). After authentication, you request (implicitly as part of the federation protocol) a specific token of the security domain/realm where the application is conntected to. This use case makes use of the on-behalf-of feature of the STS (.../fediz-idp-sts/<realm>/STSServiceTransport). As you might imagine, the identity mapping implementation is fairly easy as you just lower- or uppercase the principal name. More information about how to plug in different identity mappings see below in Identity Mapper. Note: You could also make use of the Overlay feature of Apache Maven. Some beans must be updated and added to the Spring configuration file cxf-transport.xml. The changes for a new realm are highlighted in bold. In this case, only a trust relationship from realm A to realm C is established and it's based on identity mapping. The new realm signs the SAML assertion with a different signer certificate. 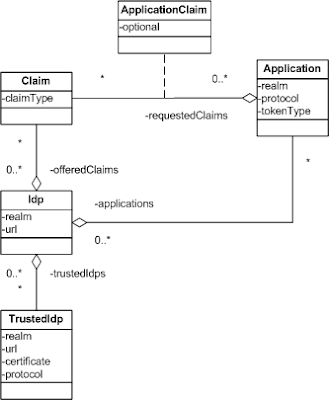 The certificate must be added to the truststore thus another realm is able to validate the SAML assertion signed by realm C.
Note: The above federation relationship definitions do not cover the use case that another realm must trust realm C but I recommend to add the certificate for completeness reasons. Note: Copy&paste an existing stsKeystore properties file. Two JAX-WS endpoints are required depending on whether you need to support username/password authentication in the STS (WSDL Port TransportUT_Port) and/or issue a SAML token on-behalf-of another SAML token (WSDL Port Transport_Port). The former requires an authentication backend which is file based in the Fediz STS. The file based authentication backend relies on the UsernamePasswordCallbackHandler which uses a spring map with user name and password entries (see beans upCallBackHandlerRealmC and REALMC). The bean which defines the username and passwords is defined in the imported spring configuration file passwords.xml. The claims of the users in the two realms are defined in userClaims.xml. You can find more information about managing the claims in an older blog. If you add a new realm, the Identity Mapper provided in org.apache.cxf.fediz.service.sts.realms.IdentityMapperImpl must be enhanced. In practise, you access a database, LDAP or web service to get the mapping. You must implement the interface org.apache.cxf.sts.IdentityMapper to customize the identity mapping to your needs. The Fediz STS is based on the Apache CXF STS. The STS supports several realms where each realm is connected to an authentication server like LDAP, file (Testing), database or a custom authentication server. The service consumer must know from which STS realm he requests a token from by choosing the appropriate URL. The distinction is based on the syntax in the URL. 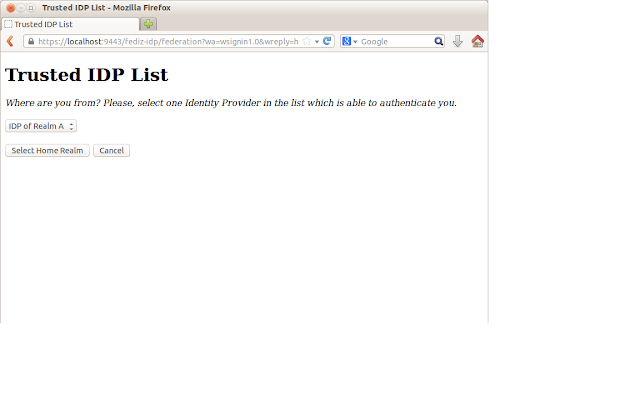 The syntax in the Fediz STS is https://:/fediz-idp-sts/<REALM>/.... The distinction is after the servlet context fediz-idp-sts. This behaviour is implemented in org.apache.cxf.fediz.service.sts.realms.UriRealmParser and configured in the bean customRealmParser. You can implement a different distinction based on the machine name, http port or servlet context. Maybe you prefer to deploy the realms in different JVMs. You just have to implement the interface org.apache.cxf.sts.RealmParser. When you request a token on-behalf-of another SAML token, the STS must be able to figure out from which realm the token has been issued. As above, the STS provides an interface which must be implement to change the default behaviour of the Fediz STS. The default behaviour is implemented in org.apache.cxf.fediz.service.sts.realms.SamlRealmCodec and expects the realm encoded in the CN (Common Name) of the signer certificate. This class implements the interface org.apache.cxf.sts.token.realm.SAMLRealmCodec and can be customized. You have to update the bean samlRealmCodec or update the bean which references this bean. This extension will be available in CXF release 2.7.6 which is not yet available. But you can run tests with the SNAPSHOT build till this version is released. Please provide feedback to the CXF mailing list. Different logging frameworks (SLF4J, Log4J, Logback, JUL) can be used to log events for Apache CXF STS. The configuration allows to define which logger should log messages till to which log level. That works fine to drill down generic issues but it doesn't help too much to know whether a certain user could successfully log in or had any specific issues. Further, the WS-Trust interface is very generic. Therefore, the same user can request tokens but for different applications using different credential types. If a log in error occurs some context information is required to easily drill down user specific issues. All this information are available within the core classes of the STS and thus not customizable without patching these classes. The next release of CXF will provide a customizable logging/auditing functionality to fulfill various requirements. The Spring framework provides an eventing mechanism which is designed for simple communication between Spring beans. Instead of introducing a new eventing mechanism to push data to a class which processes the data and writes it to a log file the new feature leverages the usage of the Spring framework in the CXF STS. How Spring eventing works is described on the following blog. If you don't want to delay STS related processing you can publish the events asynchronously which is described here. If you want to configure another Application listeners, just add a bean configuration and you're done. logLevel String No FINE Which log level should be used? logStacktrace Boolean No No In case of an error, shall the stacktrace be logged? If you want that all LoggerListener related log messages are written into a different file (ex. audit.log) I highly recommend to not use Java Util Logging as it's not so easy to configure a dedicated handler/appender for one logger. # CONSOLE is set to be a ConsoleAppender using a PatternLayout. # AUDIT is set to be a File appender using a PatternLayout. I described in a previous blog how to configure the CXF STS for an LDAP directory for authentication and to retrieve user claims (attributes). The new release 2.7.5 of CXF provides extended support for roles managed in a LDAP directory. In previous versions, the LdapClaimsHandler added groups as roles if the groups were assigned to a multi-value attribute of the user. The new release provides an LdapGroupClaimsHandler which supports the case where an attribute of the groups lists the users who belong to this group. Further, it introduces the semantic of an application role. A user might have the role "User" for application X and role "Manager" and "User" for application Y. The STS provides the semantic of an application with the AppliesTo parameter which is a URI. If you request a SAML token which includes the roles for a specific application (ex. MyApp), you get User and Manager back. A mapping is required in the STS to map the AppliesTo URI (URL or URN) to a String value like MyApp. The sub-project Fediz provides in 1.1 (not released yet) a Maven profile to build the STS with an LDAP backend (instead of managing users/claims in a file). You can have a look at the ldap.xmlhere. The following configuration configures the LdapClaimsHandler and LdapGroupClaimsHandler. There is nothing special for the LdapClaimsHandler. The LdapGroupClaimsHandler also uses the Spring LdapContextSource and LdapTemplate. groupObjectClass No groupOfNames Object class for groups. Used for search filter. userNameAttribute No cn User id attribute. Only required if LDAP is not used for authentication and thus the DN of the user must be resolved first. Used for search filter. userObjectClass No person Object class for users. Only required if LDAP is not used for authentication and thus the DN of the user must be resolved first. Used for search filter. The bean appliesToScopeMapping defines the mapping of the URI in the AppliesTo variable to a Name as URI's are not valid within a CN of an LDAP group. DEV_<Application>_<ROLE>_Group and UAT_<Application>_<ROLE>_Group The groupNameScopedFilter will look like this DEV_SCOPE_ROLE_Group (assumption: Different STS instances are deployed for development and pre-production). Last but not least I'd like to comment the default value of userNameAttribute which is CN. As per recommendation (5.4) the CN is typically the person's fullname and therefore doesn't fit for the user id (login name). Due to the reason that the LdapClaimsHandler had the cn as default value I wanted to keep that in sync and change it in the next non-patch release of CXF. If you face issues or like more functionality send a message to the CXF mailing list or open a JIRA issue. New features are going to be added in the next version 1.1 of Fediz. I described here how to configure the new Fediz plugin for Spring Security with Container Managed Security (Pre-Authentication in Spring Security terms). The current snapshot version of Fediz 1.1 provides also full/native Spring Security support which means the Servlet Container runs unauthenticated (no security constraints defined in web.xml) and Spring Security enforces authentication. or download it from the snapshot maven repository. A new example springWebapp has been added to the distribution to show this. As in the Pre-Authentication case, the application can get access to the Spring Security Context like this: SecurityContextHolder.getContext().getAuthentication(); The Authentication object is of instance FederationAuthenticationToken provides the following methods. You can get more information from the Fediz Wiki how to configure Spring Security or have a look at the example here. The example shows how to configure Fediz for Spring Security and how to use the Spring Security API in your application code. Please post feedback and ideas to the CXF mailing list or the JIRA task FEDIZ-39. Apache CXF Fediz is a subproject of Apache CXF. Fediz helps you to secure your web applications and delegate security enforcement to the underlying application server. With Fediz, authentication is externalized from your web application to an identity provider installed as a dedicated server component. The supported standard is WS-Federation Passive Requestor Profile.